This is something I do in my workshops. Just before lunch, when everyone’s tired. You can imagine their surprise (and lack of enthusiasm). We’re not talking about being Picasso or Hemingway, here. This is marketing. We’re not waiting for the muse. Trying to invent something new and groundbreaking. We’ve got to come up with a blog title, a subject line, a headline. Under pressure. That’s the real world, for us copywriters and content creators. You’re tired. Hungry. Stressed. And you’ve got to come up with a cracking, career-boosting idea. Yet the page (and brain) is completely blank. Don’t panic. Over the years, I’ve developed four creative formulae. Four techniques to help you generate instant ideas. And, yes: in the workshops we always hit 30 ideas in 30 minutes. Usually, closer to 40 in 30. Before we get to the techniques, though, a point about how many ideas you should come up with. I gave a talk in Thailand a few years ago. I was one of a bunch of guest speakers from around the world. My topic: digital. The speaker before me was a wonderful guy from India. Creative director of Saatchis, if I remember right. When trying to come up with an idea, most people ‘fish‘, he said. I used to fish at school – we had our own lake. I’d go there early in the morning, throw a line in and wait. And wait. And wait. Waiting for that pesky, elusive fish. Start panicking when the time for the morning breakfast bell approached – and I had nothing to show for my hours of patience. Just like how most people try to crack an idea. They do their prep (read the brief, do some research, get in the ‘zone’). Grab their favourite pen and pad. 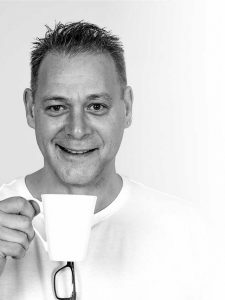 Make a cuppa. Then sit there looking at the blank page, waiting (hoping) for the idea to arrive. Instead, this speaker said, we should trawl. What happens when a trawler goes out to sea? It gets lots – everything is scooped up. What do they do with the stuff they don’t want? Throw it back. They pick out the best. So, when coming up with ideas, come up with lots – even if they’re not very good. Don’t wait for the perfect idea: it doesn’t (often) happen. I’ve never forgotten that advice. Trawl, don’t fish. Get lots, then pick out the best. Here, as promised, are those four creative formulae to help you do exactly that. Let’s start with the simplest. Although simple, it can be one of the four’s most powerful. This is about combining opposite words in a headline. 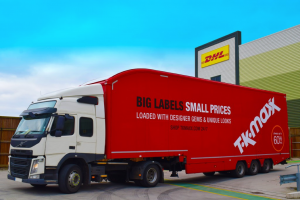 ‘A big offer on a small car’, for example. You don’t expect to see a positive and negative set of words in a headline: it takes you by surprise, and gets your interest. Begin by writing down associated words. Think of your proposition: then list any words you can think of that relate to it. For example, let’s say we’re selling tissues (I happen to have a pack on my desk). The proposition is that they are particularly soft. Do any of those words have opposites? Yes. So combine them to create a headline. How about: ‘Soft tissues for hard times’. Or: ‘Laugh or cry. We’re here for you.’. Or: ‘When times are black, reach for white‘. Three ideas in – trust me – a matter of moments. I spent mere seconds coming up with them. Almost every word in your list of associated words will have an opposite. Some, easier than others, of course. Opposite of ‘fold’? Maybe, ‘flat’? ‘Feeling flat? Reach for the fold.’. Yeah: not so good. But it’s an idea, at least. It might develop into something else. I’d write it down. I usually start with the juxtaposition, because it’s so easy. It starts to fill the page with ideas. I stop panicking (quite) so much – if the client needs a quick headline, I’ve got something at least. Ah, that advertising favourite. The pun. The pun works by combining two ideas in one word. You read it once (‘I think I understand that’). Stop, re-read it and work it out. 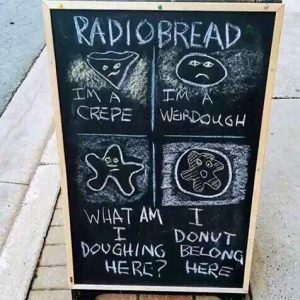 You see puns everywhere. Although people turn their nose up at them, they can be very good. The pun works the same way as the Juxtaposition. Get your proposition, and word associate. Do any of those words have two meanings in two different contexts? Or sound the same as a word that’s spelt differently? Yep: ‘soft’ has two meanings – soft (as in opposite of hard) and soft (as in gentle). Headline: ‘You’re just a big softie’. ‘Tears’: as in what flows from your eyes (noun), and tearing/ripping something (verb). Headline: ‘When the heart tears, soak them up’. Headline: ‘Keep these to hand. They’ll make you feel all white’. ‘Tissue’: sounds a bit like a sneeze – ‘a-tissue‘. Headline: ‘Got a cold? A-tissue, a-tissue’. Now, remember: I’m not trying to come up with the perfect idea. I’m trawling – I want to come up with lots. Not get slowed down by applying any sort of quality control. In other words, I’m not saying any of those thoughts are any good. But I’m filling the page (the trawler’s net). This is one of my favourite techniques. I started using it decades ago when working almost exclusively with financial services. Clients would turn their nose up at word-plays – such as the Juxtaposition or Pun. But we still need to get cut-through. So the Straight/Quirky uses a very boring headline. A simple, straight statement of what the topic (product/service) is, or does. The more boring and straight you make it, the better. But the image is quirky. The quirkier the better. 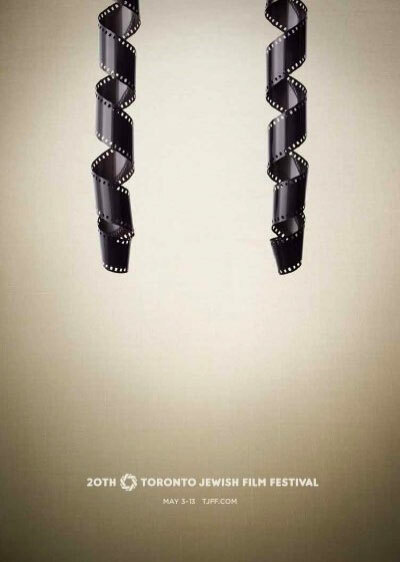 ‘The 20th Toronto Jewish Film festival’. Hmmm. That’s not going to grab someone’s attention. This third formulae is different from the first two. We don’t use associated words. Instead, write the most boring statement you can about the product, service or topic. Or: ‘Soft tissues that come in a box’. Or: ‘They’re white and strong’. Now, we need the quirkiness to get impact. Quirky visual for ‘Very soft’? The ‘pp‘ symbol from music (letting the musician know to play very softly). So, a nice sheet of written music (perhaps the Celine Dion track from ‘Titanic‘?). A ‘pp‘ written prominently. Headline: ‘Soft. Very soft’. Straight headline: ‘Soft tissues that come in a box’. Straight headline: ‘They’re white and strong’. I really like the Straight/Quirky. It’s my second preference after the Juxtaposition. It gives you the chance to simply say what you want/need to say. But get the impact and eye-catching visuals to grab someone’s attention. Onto our fourth and final formula. This is where you use the established interest/engagement of something, or someone else. An image we know really well (see the version of Michelangelo’s Creation of Adam image, above). A movie or TV series. Or something we grew up with and are familiar with. 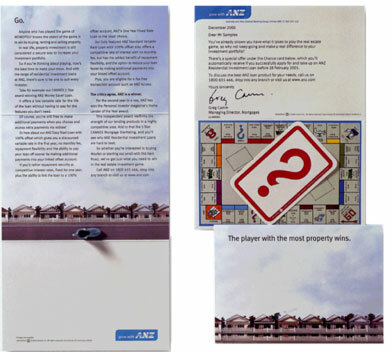 For example, this direct mail piece for the ANZ Bank’s property investment services. To be honest, this fourth formula worries me a little. It’s the only one that doesn’t come directly out of the product or topic. Valid for trawling: just watch that the borrowed element matches and reflects the brand. In my workshops, the way I address this concept formula is to ask attendees to call out their favourite TV shows or films. ‘Game of Thrones’, they shout. ‘Seinfeld… The Simpsons… Breaking Bad… Orange is the New Black… Suits… Titanic… Toy Story… Peppa Pig…’. And so the list goes. I write them all down – covering a white board. When we’ve got enough, we look for characters, scenes or sayings that we can use to dramatise the product/message. In this instance, our tissues. For example, Game of Thrones. Headline: ‘Winter’s coming’: close up of someone’s red, runny nose. Another three ideas, in quick succession. To be fair, this article took me longer than 30 minutes to write (D’oh!). And I listed only 14 ideas. Trust me: I could have come up with a whole load more. And, in my workshops, we do. Never get stuck for an idea. Trawl. Get lots of thoughts. Then pick out the best three or four. If the client rejects them, guess what: you’ve still got that net-full of trawled ideas to go back to. You don’t have to start again. But these four are the ones I use everyday. A tweet. A subject line. A whole branding campaign. 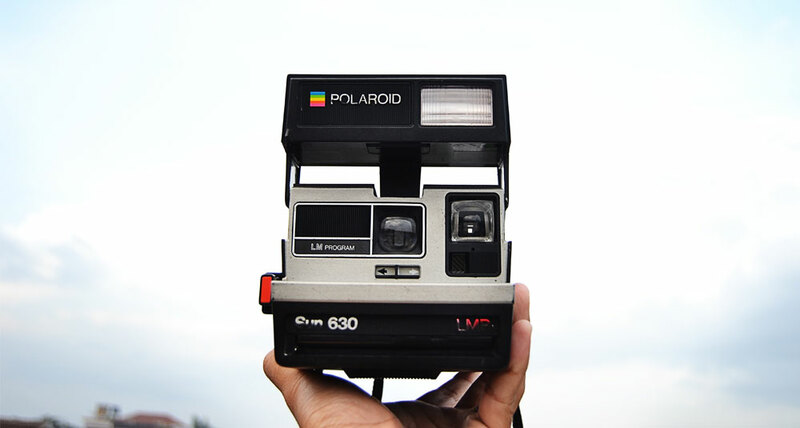 This article uses a Straight/Quirky: straight headline, and quirky visual (the Polaroid camera). I hope they help you create concepts. Grab that net. Throw it in. Get the rusted bicycles and wellington boots. Then pick out the best.